Lee Thacker is Vice President, Secretary and Trust Officer with Caldwell Trust Company. 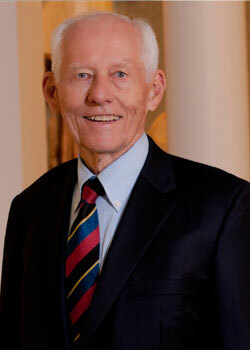 He joined the firm in 1996 after serving in the banking and financial services industries since 1959. He holds a degree in Economics from Duke University and is a Certified Financial Planner. He also continues his decades-long commitment to his work with the Boys and Girls Clubs where he has been a board volunteer in Columbia, South Carolina, Orlando, Florida, Atlanta, Georgia and now the Boys and Girls Clubs of Sarasota County. Lee has been a director of Caldwell Trust Company since 2007 and serves on the Executive and Trust Committees. When H. Lee Thacker, Jr., moved to Venice from Atlanta in the mid-90s, he looked for a solid, reputable company to handle his investment needs. “I visited Caldwell Trust Company as a potential client and was so pleased that I signed on, “he says. He could not have known that he had also found a new career as both a staff member – he is vice president, secretary and trust officer – and a director. His wife Suzanne had also become a part of the Caldwell family as trust compliance coordinator.